The report, Evaluation of Construction Air Quality and Noise Commitments and Mitigations (embedded below), was conducted by Sandstone Environmental Associates of Metuchen, NJ and first previewed in the Daily News. Sandstone was paid by Atlantic Yards Watch, via a $4,000 grant from Council Member Letitia James; the company does not limit work to community groups, as it was hired by Forest City Ratner for its Ridge Hill Project. Of course, the main message of the report is exactly the opposite: neither Forest City nor the state takes complaints seriously enough. The report states, "However, many of the workers seem to 'get away with it' and the low probability of being caught creates little incentive to follow the protocols." Nor have overseers been stringent enough to protect the community. For example, due to the size of the project and the need for nighttime work, the report suggests that the noise mitigation plan should go beyond the city Noise Code and consider measures taken by other major construction projects such as the Boston Central Artery and Tunnel Project. It bans the use of impact devices (jack hammers, hoe rams, pavement breakers ) at night and authorizes the site engineer to stop a contractor’s work, without compensation for lost time, if noise conditions are unacceptable. It also requires noise measurements to be submitted on a weekly basis. The report's summary acknowledges that the "construction mitigation measures... were intended to be state of the art," but "there are continual violations and difficulty with enforcement." But why? The report suggests that Forest City's "focus has been on finishing the arena by the September deadline, not on conducting construction operations in a manner that minimizes disruption to residents." Also, "state and city agencies have apparently been overwhelmed with the volume and frequency of complaints about construction and/or did not have adequate means of handling them," and there are few penalties for failing to abide by the MEC. Even if most workers, drivers, and contractors do follow protocols, "the sheer size of the construction effort means that even a small percentage of violations can add up to a large number incidents and citizen complaints," the report says. The report groups problems into the several categories. Meteorology equipment has longer averaging period than PM10 monitors. PM10 monitoring system is not state of the art. No provisions for monitoring PM2.5. Construction parking demand underestimated and parking spaces overestimated. Geographic areas subject to significant noise impacts underestimated. OITC rating of double-glazed windows may not be sufficient for high levels of construction noise. Air quality monitoring and other oversight during extended hours is absent. Construction Mitigation Plans have not been automatically updated as local regulations have been improved. Wetting of surfaces is inconsistent. Coverage of storage piles is inconsistent. Coverage of loose material in trucks is inconsistent. Noisy equipment is placed at property lines without shielding. Trucks idle for more than 3 minutes. Trucks and construction equipment use non-approved routes. 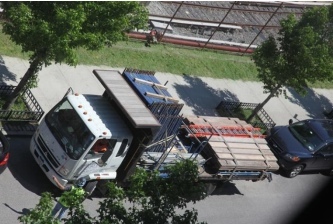 Truck drivers and workers ignore parking regulations. FCRC construction coordinator/community liaison role is underutilized. ESDC community liaison position has been vacant for over a year. Responses to inspect damage slow or absent. NYPD overwhelmed with the problem of frequent illegal parking. FCRC’s OEM (on-site environmental monitor) function is understaffed. ESDC’s on-site environmental monitor function is understaffed and visits are too predictable. City and State agencies approve extended construction hours without fully understanding the severe impacts on nearby residents (e.g., use of a hoe ram late at night). Quarterly reports and other information are not available on-line. MTA is not included in oversight protocols for LIRR property. Equipment that does not meet air quality specifications permitted to remain for months pending replacements that can comply with specifications. Notification to ConEd regarding electrical grid should have occurred sooner. Drivers can be dismissed under Two Strike policy. Contractors may not be compensated for lost time when forced to mitigate violations of MEC. Otherwise, MEC violations do not cause penalties for FCRC or ESDC. Ambitious construction schedule is so vulnerable to contingencies that extended construction hours have become the norm rather than the exception. Confusion over which work is on the critical path leads to unnecessary extended hours. CEQR Technical Manual protocols updated in 2010 and 2012 and additional updates anticipated for future. Greenhouse gas (GHG) analysis, which is now required by CEQR Technical Manual, should be applied to the 25-year construction period. Construction worker parking during arena events needs to be reevaluated, especially given the reduction in planned parking spaces. Position of Independent Compliance Monitor (ICM) required by Community Benefit Agreement (CBA) should be filled. Filling this position as mandated by the CBA would provide citizen groups with leverage in requiring better implementation of the construction mitigation measures in the MEC. Position of ESDC community relations liaison, which has been vacant for over a year, should be filled. Filling this position would a direct line between ESDC and citizen representatives and elected officials and would alleviate the difficulties of presenting community issues at the District Cabinet meetings. Interagency Task Force announced by ESDC in May of 2007 should be formed and meet monthly, and include representation from local elected officials. More effective implementation, inspection and enforcement for completion of future construction must be addressed in an SEIS. A schedule for scoping and conducting the SEIS needs to be established. Existing and past construction problems must be addressed in detail in the SEIS and solutions developed. Any construction activities not directly tied to the opening of the arena (if they exist) should be limited to normal M-F daytime construction periods. Quarterly HDR Reports must be issued more quickly to identify problems and remedies more quickly. State and City agencies with enforcement responsibilities, the contractor, HDR and any other inspectors, and local elected officials should review and agree to improved enforcement practices. Other specific mitigation measures as noted in the sections of this report. Damage from vibrations, or water? problem!" 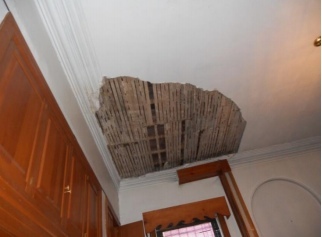 A 311 complaint about emerging cracks in the ceiling on May 22nd had been filed two weeks earlier. She again called 311 and an operator stated 311 would not take the call. Then she went to the Atlantic Yards Ombudsman’s office and was told an engineer would inspect the damage. At 5:30 pm that day, an FCRC representative arrived and took pictures. A vibration monitor is present in the resident’s basement, but FCRC’s engineer eventually determined that water damage was the “primary” cause and that no exceedances of acceptable vibration thresholds occurred. However, FCRC agreed to repair the ceiling. Failure to use dust suppression when unloading materials is evident... on June 1, 2012 at the Barclays Arena site at Carlton Avenue and Pacific Street... The observer noted that dust drifted into the residential neighborhood, as indicated by the fallout on a nearby parked car (below, right). The observer called 311 and was told to contact the contractor. OEM’s quarterly reports state that many observed dust plumes do not migrate off-site. However, residents have frequently observed off-site dust in public areas due to construction activities. On March 26, 2012, for example, pedestrians at the corner of 6th and Atlantic Avenues were forced to walk through clouds of dust blown from the Barclays construction site (below, left). Despite the emphasis on training, the actions of individual construction workers are a prime source of citizen complaints. Illegal parking, illegal idling, driving down the wrong streets, standing by while equipment spews dirt into the street or stirs up clouds of dust, failure to cover loose materials, and placing noisy equipment at property lines near residences without shielding are just a few of the numerous types of complaints documented by angry residents over the past two years. Perhaps managers did not get the word to all of the employees. Perhaps the mix of employees changed during the course of the construction period and new ones did not get the message. Perhaps the construction workers are used to high levels of noise and dust and don’t understand the reasons for all the fuss. Perhaps the workers don’t want to be bothered with wetting soils or feel they don’t have time for it. Perhaps employees have been doing their job the same way for a long time and “nobody tells me what to do!” Regardless of the reasons, the training concept fell short. Enforcement procedures include the Two Strike rule, which allows FCRC to remove a driver from the project if he parks illegally or uses the wrong route (e.g.) more than twice. However, many of the workers seem to “get away with it” and the low probability of being caught creates little incentive to follow the protocols. Although FCRC can suspend contractors without compensation until a problem has been remedied, this appears to have been applied primarily to emergency situations (e.g., the Casagrande drill), where contractors generally respond quickly. It does not appear to be applied to situations where workers fail to suppress dust during loading operations. HDR’s weekly reports should be posted on-line on the ESDC website in a timely way. ESDC should make the reports available to community groups without the need to request them through FOIL. The timing of HDR’s site visits should be less predictable, and they should visit the site on different days of the week and at different times of the day. HDR’s staffing for site visits should be commensurate with the scope and schedule of the work. HDR should regularly ensure Construction Mitigation Plans are updated to meet updated regulations. An Ombudsman should be hired to address community concerns and facilitate accountability of other ESDC Atlantic Yards-related staff. ESDC should specify the authority of the ombudsman to resolve construction issues. ESDC should specify the lines of communication among the ombudsman, the construction coordinator, the OEM, and HDR and the means by which issues will be resolved.